I bought a 6″ by 1/2″ ferro rod for my long term survival bag; this super thick ferro rod is awesome and will last forever, but it could get lost easily because it’s dark and doesn’t stand out. I wanted to make a bright handle that could also be useful in other ways, and not just buy a ferro rod with an orange handle. After checking many options and seeing what other people had used as handles I came up with my own idea. Others have used acrylic or epoxy to make their custom color handles, but those can’t be used for anything else. Painting the ferro rod wasn’t the best solution either, because the paint would eventually get scraped off. 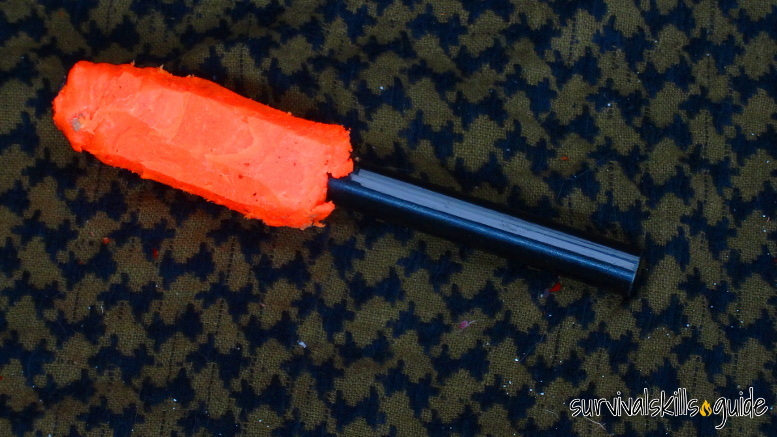 Why not use hot glue mixed with bright paint to make a handle? The neat thing about hot glue is that it is easy to use, cheap, and can be reused. 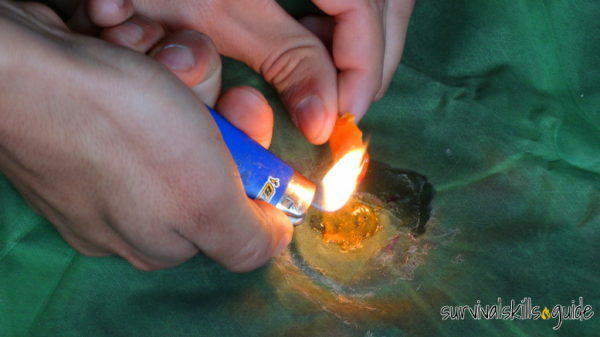 I can use the glue anytime by cutting a portion and using a small flame to melt it. I always keep some hot glue in my repair kit. 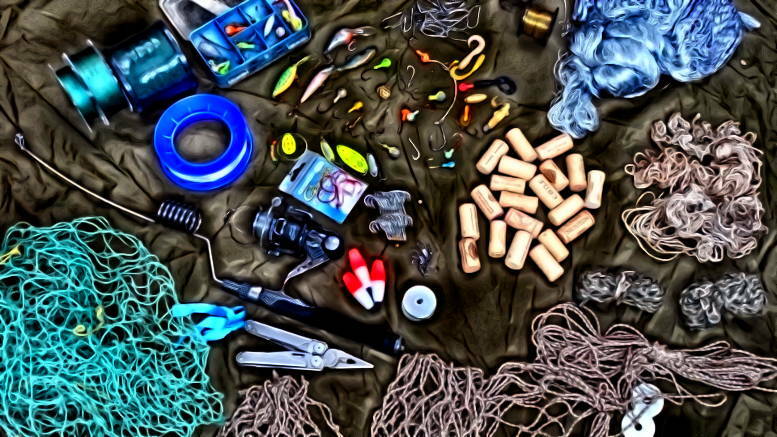 You’ll need hot glue, fluorescent acrylic paint, an empty can (tuna can would be best), and a toothpick (if your ferro rod has a lanyard hole). 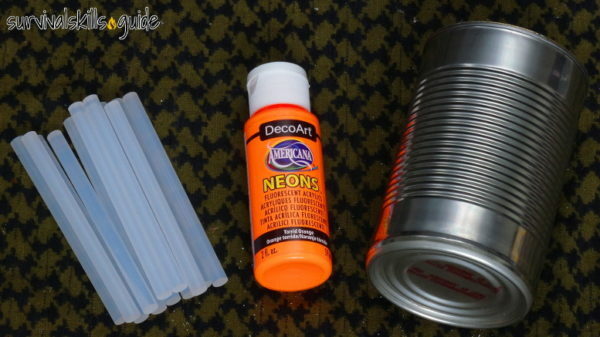 Heat up the hot glue bars inside the can at medium to low heat. 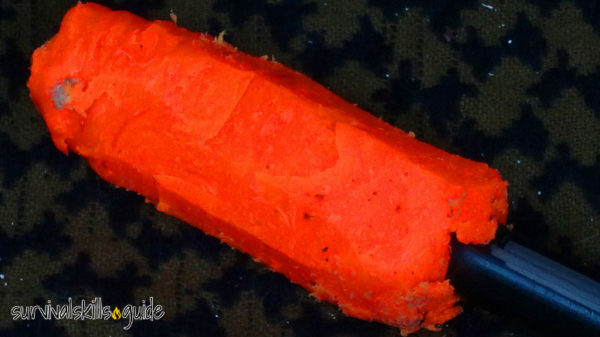 The melting hot glue gives off a nasty plastic smell so do this over a fire or stove, in a well vented area. As soon as the hot glue melts, pour the acrylic paint into it, until you’re satisfied with the color. I used a stick to mix the paint in. While the glue is hot, spread it over the ferro rod. I placed a tooth pick inside the ferro rod hole so that I could drill the hole again after the handle hardened. I rotated the ferro rod while applying the hot glue. After applying various layers I left it to cool. I also shaved off the outer layer of glue to make it smoother. The ferro rod handle feels nice; the glue adds good grip. I bet this would also work well with glow in the dark acrylic paint, but it might not be as bright during the day. 1 Comment on "Making a Bright Colored Ferro Rod Handle"
Very good idea – might want to add a loop of paracord or other cordage inside handle to be able to hang or tie off with lanyard to your person too. I also keep glue sticks around too, the liquid container can be pierced or suffer air leakage and its ruined without you knowing it.